The Colorado River, the old gateway to California. Yuma is often viewed as nothing more than a way-point to bigger cities like Phoenix, Tucson, or San Diego (depending on your direction). However, Yuma has a lot of history for travelers looking for a small town weekend getaway. 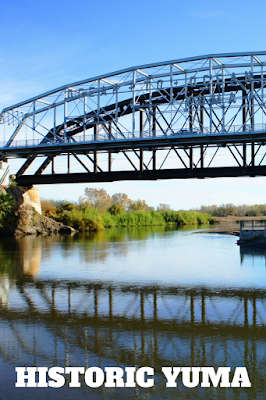 Yuma’s part in United States history began during the California Gold Rush when the Yuma Crossing over the Colorado River was used as the gateway to California. Today Yuma is an important agricultural town, but it still has vestiges of its past preserved in its historic districts. The Yuma Territorial Prison was in operation from 1876 to 1909. The first seven inmates arrived July 1, 1876, and actually had to build the cells they were locked in. The prison was always under construction, which, as our guide pointed out, was probably a good thing as the skills learned may have helped rehabilitate some of the prisoners, providing them with skills that could be used when released back into society. Prisoners forged steel to make the cages and doors, grew produce, raised and butchered stock, and cooked meals. The first cells were built with stone, which might have helped insulate the cells from the intense summer heat. It’s hard to imagine spending any time in these small cells, each furnished with two three-level bunks and barely more than enough room in between to walk through. The later cells were dug into a huge hill of Caliche, incredibly hard clay consisting of soil that has been cemented together by lime. In this hill is the dark cell where incorrigible prisoners were punished. While there are no records of guards tossing snakes through the tiny hole of the roof into the pitch black cell below, there are hospital records of men being treated for snake bite wounds after being released from the dark cell. Imagine six people living in this cell. It is said some of the cells are haunted, but I’ll leave those stories as well as the story of the prison’s most famous inmate, Pearl Hart, for when you visit the museum or, better yet, join one of the guided tours. Visitors can watch a film and tour the prison on their own or join one of the guided tours (call ahead for the day's tour schedule). If you can, join one of Dave Yunker’s tours on Monday. Dave is a retired school teacher, and it shows in his presentation as he makes sure to share all the facts and has even done research of his own to find out things like who are the people buried in the prison cemetery not listed in the records and why there would be extras. The Ocean-to-Ocean Highway Bridge crossing the Colorado River. We stayed at the Hilton Garden Inn Yuma Pivot Point which put us in the perfect location to explore the historic downtown riverfront. This is the location of the Yuma Crossing, first used by the Native Americans to cross the Colorado River and later used by the Forty-Niners heading to California during the California Gold Rush. Southern Pacific Engine No. 2521. Here are two riverfront parks along the Colorado River. Just outside of the hotel are speakers playing banjo music at all times of the day, plaques explaining the history of the area including stories of the steamboats, Gold Rush, Native Americans, and irrigation, and Southern Pacific Engine No. 2521, a train engine that traveled 2.5 million miles from 1907 to 1957. Native waterfowl in the East Wetlands. Within this area along the Colorado River are seven miles of waterside bike trails and three miles of hiking trails. We walked part of the trails, crossing under the Ocean-to-Ocean Bridge and exploring the East Wetlands. Previously the banks along the Colorado River were overrun with invasive, non-native plants. In the past 20 years much work and money have been put into this area to restore the wetlands as they originally were, and now the area is again home to native flora and fauna, including many species of waterfowl like egrets and pelicans. Fresh local produce at the Sunrise Farmers' Market. Also in the Historic Riverfront District is the Yuma Quartermaster Depot State Historic Park. Beginning in 1864 six months’ worth of supplies for military posts which came by ship from San Francisco were offloaded from steamboats and stored in the storehouse. The storehouse is still there and now houses an exhibit on dams of the Colorado River. The park also contains Yuma’s oldest home, the quartermaster’s house and kitchen. The adobe structure was built in 1859 and was used as the quartermaster’s personal residence. Sundays October through April the park also holds the Sunrise Farmers’ Market, which sells local produce. Yuma’s Main Street was historically the center of activity, but over the decades, as has happened to many downtowns, Yuma’s Historic Downtown’s hustle and bustle subsided as businesses moved away from the town center. Main Street still is a bit of a ghost town, with some of the 1920s buildings remaining empty, but Main Street is making a comeback with the revitalization of downtown. After spending long days touring around Yuma, it was nice to come back to our hotel, take a disco nap, and then make the short walk, serenaded with banjo music, to the historic downtown district for good eats and craft beer and wine. While many of the businesses in Yuma’s historic downtown are fairly young, Lutes Casino is one of the old timers. The building was erected in 1901 and Lutes Casino, which isn’t a casino at all but rather a pool hall and restaurant, is the oldest continually operating pool hall in the state of Arizona. R.H. Lutes, a businessman and Justice of the Peace, acquired the pool hall in the middle of the century and it has been a family-run operation ever since. R.H. Lutes also ran Lutes’ Gretna Green Wedding Chapel where he officiated the weddings of many Hollywood celebrities who traveled to Yuma to get away from reporters and have low key nuptials. He performed three of Clark Gable’s marriages and one for Charlie Chaplin. Lutes Casino’s décor is described as “early eclectic,” which means there is a whole lot of stuff all over the place. There’s a bicycle hanging from the ceiling, random artworks, photos of celebrities, and everything else you could possibly imagine. The food is casual fare, with burgers, hot dogs, sandwiches, and tacos populating the menu. The most shocking thing on the menu is Lutes Special or Especial. In case you can’t make up your mind, the Especial puts both a cheeseburger and a hot dog on a hamburger bun along with lettuce and tomato, and Lutes’ homemade salsa is served on the side. It sounds like a heart attack on a plate, and probably is, but it’s actually surprisingly good. Another popular menu item is the potato tacos, which are rolled tacos filled with mashed potato and topped with cabbage, tomato, mayo, and Cotija cheese. They feel much healthier than the Especial. The Garden Café's Swedish oatmeal pancakes. A lovely spot for breakfast or lunch in the middle of downtown is The Garden Café & Spice Co. The Garden Café is hidden in the middle of the block and is an outdoor family-owned restaurant on the grounds of the owners’ ancestor E.F. Sanguinetti, one of Yuma’s early settlers. The Sanguinette House Museum, an 1870s adobe building, is just next door and features the history of the lower Colorado River. The Garden Café serves family recipes made fresh daily. Even the breads and muffins are homemade. Breakfast includes scrambles, homemade quiche, Swedish oatmeal pancakes, and Yuma’s famous Walt Kammann sausages. The lunch menu includes sandwiches, salads, and fresh off the grill tri-tip entrees. Prison Hill Brewing Company's Chipotle Shredder. Prison Hill Brewing Company is Yuma’s first and only craft brewery. They also serve incredible food. Prison Hill has been open less than six months and yet already has a reputation for serving some of the best food in town, which, in keeping with the prison theme, is served on divided tin plates. All of the food is made in-house and the ingredients are prepped every morning. Wine and live music at Yuma's Main Squeeze. Yuma’s Main Squeeze is Yuma’s only winery and wine is made onsite using grapes sourced from all over the world. Pop in for wine tasting, a glass of wine or beer, or even a meal. Yuma’s Main Squeeze also offers live music some Friday and Saturday nights. During our visit a great local band, AVP Acoustics, was playing. Old Town Wine Cellar wine shop and tasting room. Old Town Wine Cellar has been open since 2003 and is located in part of the old Sears building. Owner Mike Shelhamer pours wine tastings Tuesday through Friday and also has beer tastings one Saturday a month. Old Town Wine Cellar is a wine and beer shop, so after your tasting you can purchase a bottle of wine or beer to take back to the hotel or home. Craft beer at The Pint House Bar & Grill. The Pint House Bar & Grill is owned by two of the three owners of Prison Hill Brewing Company. They serve craft beer and have 45 taps. In addition to beer, they also serve good food. Yuma’s historic downtown resurgence has also been assisted by the Yuma Art Center and Historic Yuma Theatre. The art center has four art galleries and hosts theatrical productions and concerts. 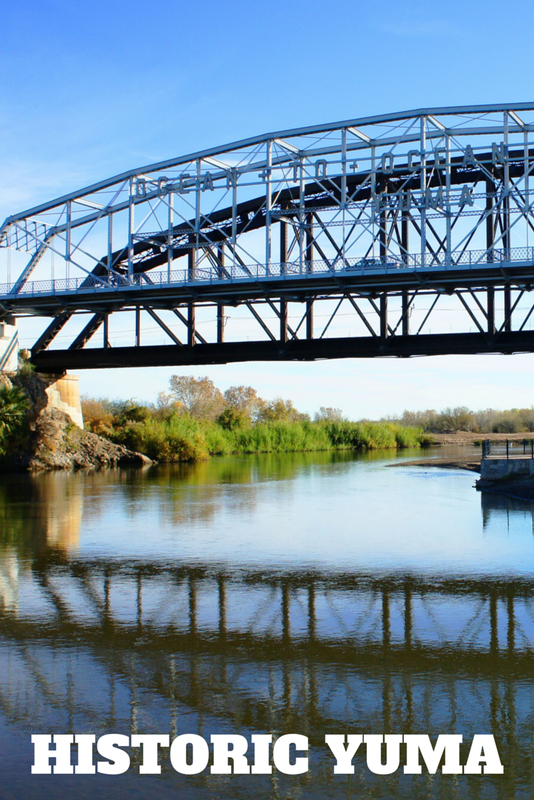 Yuma’s historic districts are a great mix of fun and education, providing a glimpse into Yuma’s historic past along with a celebration of Yuma’s present in the restoration of its riverfront and revitalization of its historic downtown.